The first summer I spent in New York, I fell in love with the Whole Foods in Columbus Circle. I thought it was as captivating as a trip to the top of the Empire State Building. To this day, I still drop in specifically to pick up a square of their cornbread...especially if I can find a middle piece. I adore middle pieces because the edges are a bit too dry for my liking. I've always liked my cornbread to be moist and sweet, more like a cake than a bread. If you agree, for the love of god, read on. Marie Callender's makes an excellent one. Whole Foods' cornbread is much along the same vein. Plus, it's rarely more than $1.50 a piece, making it an affordable and satisfying snack for a stroll in Central Park. This morning, I had an intense craving for cornbread. But rather than make the trek up to Whole Foods, I decided to make it at home. Turns out that cornbread tastes even better when you don't have to change out of your pajamas. 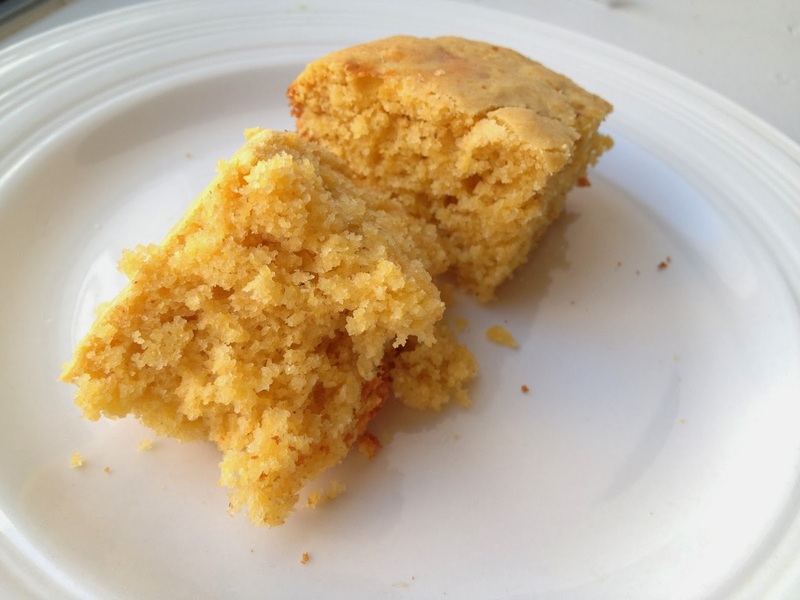 Sweet, moist and crumbly, this cornbread is like a light and fluffy yellow cake, only a bit heartier because of the addition of cornmeal. Life is too short to eat dry cornbread. I thought I could get to greatness, to my greatness, by plugging on, cleaning up each mess as it came, the way you're taught to eat your greens before you have dessert. But it turns out that's a rule for girls and sissies, because the mountain of greens is of Everest proportions, and the bowl of ice cream at the far end of the table is melting a little more with each passing second. There will be ants on it soon. And then they'll come and clear it away altogether. As the quote above illustrates, life is also too short to deprive yourself of dessert. This cornbread may be dessert-like, but that doesn't mean you have to wait until you finish dinner to eat it. Since it's technically got "bread" in the name, you can treat it as an appetizer. Dig in, before the ants steal what's rightfully yours. Preheat oven to 400 °F. Grease an 8"x8" square pan and set aside. Combine the cornbread, flour, baking powder, salt and sugar in a large bowl. Work out the clumps of sugar with your fingertips if necessary. Pour in the milk, eggs and oil and stir until just combined. Pour the batter into the prepared pan and bake 20 minutes, until golden brown around the edges. Insert a knife in the middle; it should come out clean. If it doesn't, let it bake for a few more minutes (mine took about 25 minutes).